The Marble Photo Cremation Urn is made from natural quarried black marble. 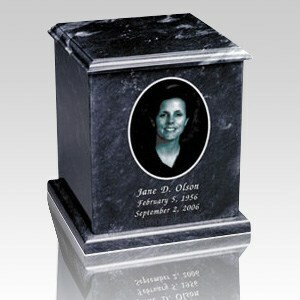 The black marble urn has a ceramic printed insert of your loved one (photo). Each marble urn is unique and no two urns will ever be the same, a wonderful urn to create memorial for your loved one. Please reply with your picture to your order notification once you placed your order (production time about 5-7 business days). "Very slow to get this product. Expect 2 weeks or more to work out the photo issues before it can be shipped.